This Sunday marks a memorable date in the spiritual history of the Church, because the spoken language officially enters the liturgical worship, as you have already seen this morning. The Church has considered this measure right and proper - the Council has suggested and deliberated it - and this in order to render its prayer intelligible and make it understood. The welfare of the people demands this care, so as to make possible the active participation of the faithful in the public worship of the Church. It is a sacrifice that the Church has made of her own language, Latin; a sacred, sober, beautiful language, extremely expressive and elegant. She has sacrificed the traditions of centuries and above all she sacrifices the unity of language among the various peoples, in homage to this greater universality, in order to reach all. And this [also] for you, faithful, so that you may know better [how to] join yourselves to the Church's prayer, so that you may know [how to] pass from a state of simple spectators to that of participating and active faithful, and if you truly know how to correspond to this attention of the Church, you will have the great joy, the merit and the chance of a true spiritual renewal. Further liturgical simplifications were introduced in May 1967 through Tres abhinc annos (which also permitted the Canon to be said aloud and in the vernacular). Additional prefaces and Eucharistic prayers made their appearance in May 1968, and the period from April 1969 to November 1971 saw the process of the introduction and imposition of a New Missal on the entire Roman Rite. In parallel with the textual and ritual reforms, de facto full vernacularization of the Mass went ahead as the episcopal conferences and their liturgists came up with their own measures. The 1965 requirement that Missals should include the Latin text beside the vernacular ceased to be enforced c. 1970. In June 1971 the Congregation for Divine Worship issued a notification conceding that the entire Mass and Office with or without the people (i.e. including the Mass and Office said in private) may be said in the vernacular, and today the vernacular exercises unchallenged dominance in celebrations of the "Ordinary Form" of the Roman Rite. 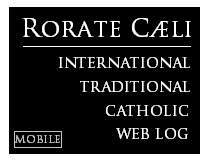 Online directories of "OF" Masses that are entirely or mostly said in Latin are incomplete, but all indications point to these being rarer than the Traditional Latin Mass. 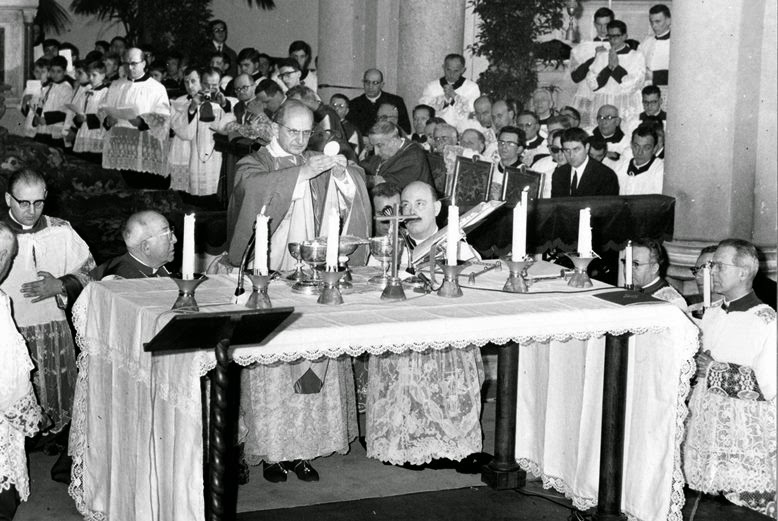 The Mass of Paul VI on March 7, 1965 did not only showcase the vernacular. As the pictures of the Mass clearly show it also involved liturgical novelties that would soon become widespread in the Catholic world. We give way here to the more capable pen of Father Benoît Wailliez and Alain de Beaugrain in describing the "first Italian Mass", its novelties, and their significance. The following description comes from their article Liturgie: quelle est "la bonne interprétation du Concile"? published in Pour Qu'Il Règne, May/June 2014 edition. The main author is a priest of the Society of Saint Pius X (SSPX) who did not intend to write any controversial words, but made the academic effort to present a historically accurate exposition of this historic Mass and its environment. It is unfortunate that this event has raised so little interest outside of Italy and that so few photographs of it have been made public. In order to truly understand the general disposition of the setting, it is necessary to look into the parish album, which is possible during a visit to Rome. 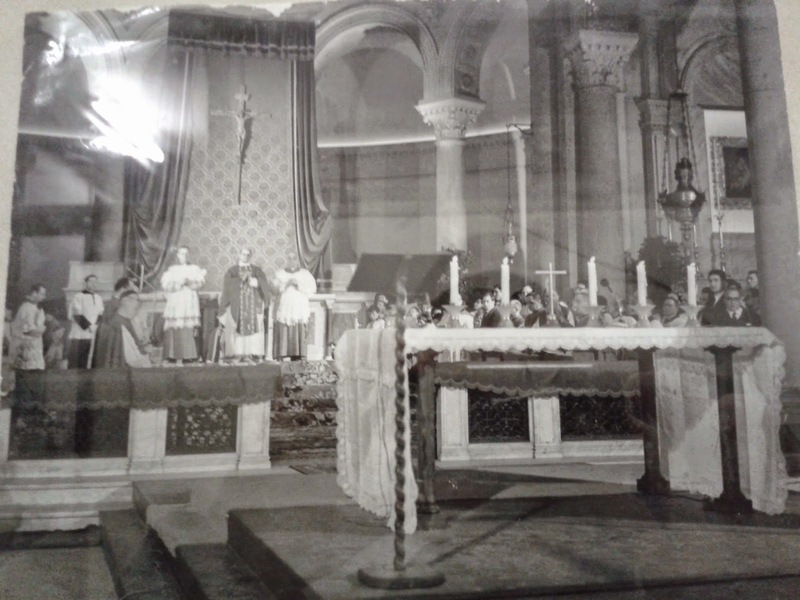 In these parish images, one can see that the High Altar and its Tabernacle had been hidden behind large drapes, which served as a background to the new layout. A monumental crucifix was placed on top of these drapes. The table-altar on top of its wooden support had been installed in front of the stone communion rail, that is, on the outside of the Sanctuary. Since no kind of movable communion rail had been installed in front of this new altar, there was not anymore any separation between the latter and the nave. These characteristics will be easier to observe in a few months, because the Ognissanti parish has prepared since 2012 a great event to celebrate, on March 7, 2015, the 50th anniversary of this historic day, along with a conference and the publication of a book including a great part of the hundreds of photographs taken on that day. While waiting for March 2015, it is possible to have a more detailed notion of the situation by taking into consideration, in the parish, the conference granted by Dom Ildebrando Scicolone, OSB, on March 7, 2014, and by meeting longtime parishioners who were present at the historic mass of Paul VI. This way, one learns that this Church of All the Saints did not have an altar facing the people before the pope's visit; only the High Altar existed, including a Tabernacle that had, since its origins, had on top of it an immense statue of the Sacred Heart, which prevented any celebration facing the people. The wooden table-altar used on March 7, 1965, was brought in by the Vatican services and the Pope's visit truly was a watershed moment, because, from that date onwards, the parish ceremonies were celebrated in Italian, facing the people, on this movable altar placed outside the Sanctuary, with no separation from the nave. In other words, by coming to personally celebrate on March 7, 1965, Paul VI had drawn the road ahead. As the explanatory brochure "The Church of Ognissanti in Rome", available at the church, says, ten years later the sanctuary had a definitive rearrangement, in order to make permanent the new layout: "the previous altar was replaced with a new one, inspired by the conciliar reform: a single block of gray marble, original and plain." We have taken interest at the question of the orientation because Paul VI had celebrated "turned to the people." Since Antiquity, the churches had been oriented in the original sense of the term, that is, turned to the Orient. The traditional sense of the liturgical celebration is not therefore "with the back to the people", but "ad Orientem", that is, towards the place where the sun rises, the symbol of the resurrected Christ. Now, in certain Roman basilicas, the so-called "Constantinian" ones, the priest has celebrated [incidentally] facing the people. In reality, these churches are "occidented", that is, turned towards the southwest (or in that general sense), so much so that, in order to celebrate towards the East, the priest celebrates, since forever, towards the entrance doors. 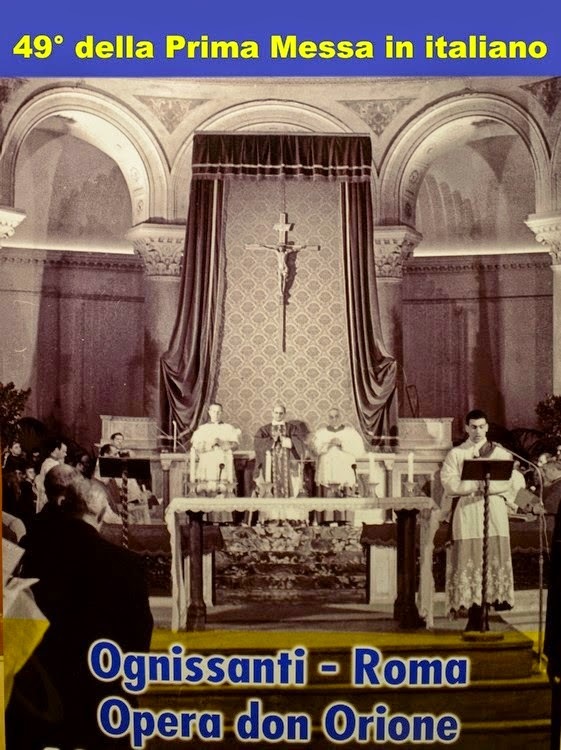 Since the church of Ognissanti is turned towards the southwest, couldn't we say that Paul VI, by celebrating towards the people, had in a general sense celebrated "ad Orientem"? After close exam, no element in the documents that the parish has preserved, not in the conference that it has organized to celebrate the memory of this mass, involves the direction of the celebration as having been chosen as "ad Orientem". Moreover, Paul VI himself did not make any mention of it. His intent was thus certainly to celebrate towards the people. 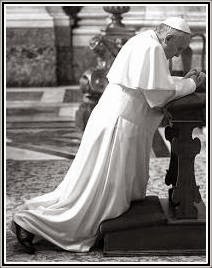 In fact, in the general audience of March 17 , he expressed the notion that the liturgical prayer is addressed to the people, because he was pleased with the fact that, thanks to the liturgical aggiornamento, "the priest at last speaks to the faithful." Intentionally celebrating the Mass facing the people, displacing the altar from the sanctuary (and in fact doing away with a tangible "sanctuary" in the traditional sense), covering up or removing the high altar, the use of a "table-altar", communion no longer received while kneeling ... we are often assured by "conservative" writers that these had nothing to do either with Paul VI or Vatican II, and in fact became widespread only years later, and against the express will of both. 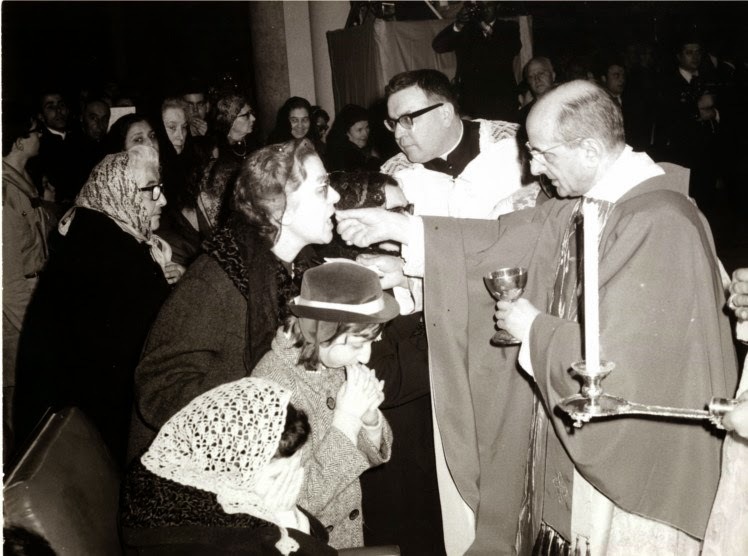 However, the records of this Mass and of Masses publicly celebrated by Paul VI in the years immediately after 1965 show that he was at the vanguard of these changes. This is ironic given the tendency in some Reform of the Reform circles to point to the "1965 Missal" as the way to resacralization and the return to tradition for the wider Church -- a Missal whose very birth was attended by many of the innovations now deplored by these same circles. Equally of note is that these innovations, which many in the Reform of the Reform camp assert have nothing to do with Vatican II because these are not mentioned in the actual text of Sacrosanctum Concilium, were already taking place in Rome itself, with the Pope's own endorsement and in his presence, long before the Council ended on December 8, 1965.